I'm always looking for non-edibles to fill goody bags, give as rewards, add to gifts, bring to school parties, etc. Boy, having food allergic children sure brings out your creative side! In honor of Earth Day, I decided to take on a decluttering-repurposing project I'd had on my list of to-do's for awhile now (and, if you're like us, your house looks like an art supply store exploded...and that's on a good day). Our babysitter Natalie gave me this idea (she's a kid crafting guru), and inspiration came from Chica & Jo's post about recycling old crayons. I channeled my inner Martha, dug down to the bottoms of our art supply bins to find a bunch of old, broken crayons, and collected my other supplies. Chica & Jo used the tin cans for melting the crayons (so eco-savvy! ), but as I didn't have 8 used, cleaned, and dried tin cans laying around, I found the foil cupcake liners served the purpose. I was also melting crayons on a pretty small scale, but if you're doing batches and batches, you might want to consider getting organized with the cans. I had to buy the silicone ice trays. You can find these ice trays at Ikea for cheaper than I'm willing to admit, but since I didn't have time to cross a bridge to our closest Ikea with kids in tow for ice cube trays, I decided to go to my local five and dime store (Laurel Village Ace) and get a few. I picked up sticks and centipedes (I couldn't resist! ), but they also had triangles, hearts, and other cute shapes. Tristan separated the crayons by color, and I would've had him peeling crayons too, but I had a babysitter day, so off to the playground they went, and off to peel crayons I went. A comment suggested soaking crayons in warm water for 10 minutes to loosen wrappers, and if you have lots, I would recommend following this advice. 1. Fill cupcake liners with color coordinated crayons, place in your lined pan, and melt in a 350 degree oven for about 8 minutes. Repeat with each color. I melted about 4 liners at a time for layering. If you decide to melt more than four colors at a time, just keep them on the pan so they'll stay liquified for as long as possible before adding them to the tray. Just remember you could always remelt whatever you need to. 2. If you're doing a rainbow or layered color crayon, use your disposable plastic spoon to add a thin layer, color by color, into each tray, tilting tray quickly and carefully to get into corners. Let it solidify and mostly cool before layering the next color with a new spoon. I waited about 3 or 4 minutes between layers. 3. For solid color crayons, I just poured the wax into the tray. The liner will be hot on the bottom, but the sides should be manageable with bare hands (just PLEASE be careful!). 4. Chica & Jo say to clean the drippings from the tray between colors...you know, that sounds like a great idea and I really hope you try it--even though time didn't allow me to do it (ok, I was trying to multitask and finish some sewing in between batches). 5. Chica & Jo also say that once cooled, to just "flip them out onto the table." I was pretty doubtful about how flippable mine were going to be, but that part was actually pretty simple. The silicone trays really did the trick! If I said this was an easy, neat project, I'd be lying. It's pretty darn messy and for an eco-friendly project, I sure used up a lot of disposable stuff. I'm hoping it'll pay off when the kids see their new crayons once they're home from the playground. The rainbow crayons came out ok, but some smoothing of the edges would make them prettier. I figure the kids will take care of that after using them a few times. The caterpillars were almost too cute to use! Logan had fun playing with them. The new crayons inspired some serious scribbling! Now...get melting and start drawing! Could a cure be on the horizon?? A recent study suggests "maybe". An article on today's edition of SFGate.com is reporting some very promising research in the treatment of food allergies. 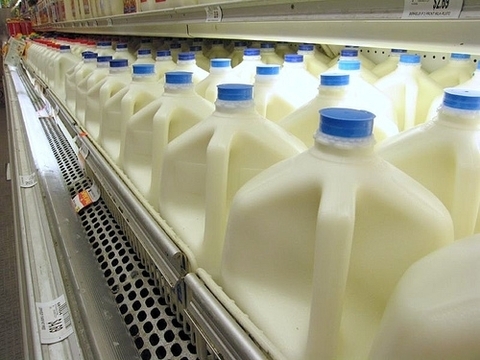 A Stanford University research team has conducted trials to test new approaches for treating patients with milk allergies. The experimental therapy involves using a drug called omalizumab for 16 weeks to prevent the immune system from responding to certain allergens while gradually exposing patients to increasing amounts of milk powder to desensitize them to the allergen. After the 16-week desensitization period, the drug was no longer given and patients still were given increasing doses of milk. SFGate reports that of the 11 patients who began the trials, 10 can consume as much dairy as they want today without any problem. Happy belated Earth Day, friends! One of many growing movements to create a greener world is Meatless Monday, whose goal is for everyone to go vegetarian one day a week. Different environmental groups have pointed to the production and consumption of meat as a huge drain on our environment. The statistics are staggering: 1,800-2,500 gallons of water used produce a pound of beef?! One-fifth of man-made greenhouse gas emissions attributed to the meat industry alone?! As you can imagine, the environmental research groups and the meat industry disagree on the actual numbers. Whatever the exact figures may be, it is safe to assume that producing meat for mass consumption does use a lot more natural resources than growing vegetables and fruits. Eating less meat is fine with my tree huggers. My husband and I eliminated hoofed animals from our diet years ago but recently I made a commitment to up our veggie/fruit consumption while lowering our meat intake even more. The transition hasn't been bad at all because the kids love stir-fried tofu and will tolerate vegetables as long as they are accompanied with a pile of saucy noodles. My biggest health concern with reducing our meat is making sure we still get enough Vitamin B-12 and protein. Foods with the highest sources of vitamin B-12 are animal products so it's a little trickier for us to get a healthy dose, especially when we are dairy-free due to food allergies. I try to make sure we get a good amount of fortified milk substitutes and cereals, eggs, and nutritional yeast in our diet. To get the protein we need, I've been integrating more beans and seeds into our daily meals and snacks. To be honest, the kids aren't completely sold on beans. They love homemade refried black beans (the tostada bar is a huge hit with them) but anything that still looks like a bean is a hard dish to sell. I think I need to follow the #1 tip of my vegetarian friend, Dawn: "Puree the sh** out of them." While I have much more recipe-testing to do, here are a couple of easy bean or seed favorites that are free of most or all of the top eight food allergens. For more information on the meatless movement including its health benefits, read up on Meatless Mondays and flexitarianism, a mostly vegetarian diet. Chili is a super flexible recipe. You can omit and sub in many different vegetables depending on what's in your fridge and what your family likes, and still make a tasty dish. Don't let the long list of ingredients intimidate you -- for the most part, it's just chopping some veggies, opening cans, and measure spices. Chili powder and cumin are key and, for me at least, so are the lightly sweetened baked beans. Heat oil on medium heat. Saute garlic and onion until onion for a couple minutes. Add other chopped vegetables (except corn) and cook for 5-10 minutes. Then add canned tomatoes, beans, corn, and 1.5 cups of water. Stir in spices. Heat until bubbling. Reduce heat to low-medium and simmer for 30 minutes until chili thickens. You can add more water after 20 minutes or so if it looks too chunky and not saucy enough. Feel free to add more chili powder, cumin, and other seasonings to taste. If you're like me and prefer your chili extra thick, steam your cubed yams in the microwave for a few minutes before cooking them in the chili. My husband doesn't like yams so sometimes I leave this out completely. For those times, definitely make sure to include brown sugar to sweeten the pot. Sometimes I add in Trader Joe's 3-Grain Tempeh (not gluten-free) to give it a meatier texture. Easter might be overshadowing Earth Day this year, but in our house, we are trying our best to give it the attention it deserves. Tristan is milking Earth Day, with his collection of empty tissue boxes (but mom, I'm reusing for Earth Day!) piled high (we had a really rough cold season), making the perfect shadow boxes for spectators to view his completed legos. He taped them down to his desk so no one could "accidentally" knock them over. The tissue boxes have also made for a fierce monster, using just markers, colored paper, and part of an old egg carton (yep, I still occasionally eat eggs cooked in my egg dedicated pan). And then there were the tissue box monster feet (yeah, I had to toss those because the "skating" around the hard wood floors got to be too much). Think: paint & paper or cardboard "claws." I started the boys with some basics about helping the earth with this cute 12 page "Happy Earth Day" coloring book by the EPA. The recycling section is a little outdated for us, but the kids got the picture. It even inspired a tv turn off day which came and went with little objection last Thursday, and will continue every Thursday as long as I can manage it. I put all the remotes (tv, dvr, vcr, dvd...) into the drawer to make it a little easier for everyone. And then there are all the "LOGAN! TURN OFF THE TV"'s from Tristan, in pure big brother style. Another easy way to celebrate is to visit your local farmer's market--for lots of organically and locally grown produce. In the Bay Area, we've got a fabulous selection. We personally visit the Stonestown one on Sunday mornings because it's convenient, there's parking, and there are just two rows of vendors, perfect for little feet. And we always leave with bags and bags of fresh fruits and veggies (don't forget to bring your own bags--BYOB!). Lots of Earth Day related celebrations happened last weekend, but you can still catch various events this weekend, including this Saturday's Earth Day SF 2011--a music festival at SF's Civic Center, Earth Stroll 2011 at Crissy Field, and the weekend celebration at the California Academy of Sciences (buy tickets online and use coupon code BAYAREA20 for 20% off your general admission). And if you're really strapped for Earth Day time with the kids, combine Easter and Earth Day by making your own recycled paper grass. Collect used colored paper all over the house (newspaper would look cute too), send it through the shredder, and crumple or scissor-curl them for your Easter baskets. SO much cuter than that green stuff they sell at the store. The funny thing is, I couldn't find a shredder that makes the long strips. They're all confetti ones now--even the one sitting in our garage! Martha does it best, anyhow. Even if Earth Day manages to come and go without a proper nod, just remember that we can definitely celebrate any day of the year. We'll have more eco-inspired crafts and stuff next week for you and the kids. When it comes to baking I'm always eager to try out new recipes. I love trying to use natural ingredients to make something simple and yummy. I also like the challenge of baking without eggs. Even though there aren't any egg allergies in our family (not since Ryken was 1 at least) it's an ingredient I feel like I can do without if I get creative. It's recommended to only replace up to 3 eggs with flaxmeal/water. I use this mixture regularly in muffins, cakes, biscotti, and pancakes and in savory ground meat dishes such as meatloaf and dumplings. I've also read (but haven't tried) adding 1/8 teaspoon of baking powder for each flaxmeal/water to retain the leavening effect that you would normally get by using real eggs. Flaxseed is a good source of Omega-3 fatty acids, essential acids that promote brain function and reduce the risk of heart disease. Bob's Ground Flaxseed Meal is free of the 8 most common allergens and high in fiber. One 16-oz bag contains 68 tablespoons. That's more than 5 dozen egg replacers in one bag! Besides acting as an egg substitute, I also like slipping in a tablespoon or so of flaxmeal to oatmeal, cereal, batter or dough of any kind. Who couldn't use the extra boost of brain food? Bob's Red Mill is making its way onto market shelves everywhere. In recent years it's been easier to find their products around my town at Raley's, Safeway, Whole Foods, and even Target. The best price I've found for their ground flaxseed meal is at Trader Joe's for about $2.70, almost half of the cost of a bag at my local Safeway. The company has an impressive line of baking products including many gluten-free flours made from beans, tapioca, sorghum, and amaranth to name a few. If you can't find Bob's products where you are or want to save by buying in bulk, check out Bob's Red Mill website for their complete product line. Buying by the case straight from the company really does make sense especially if you regularly bake in a gluten-free kitchen. 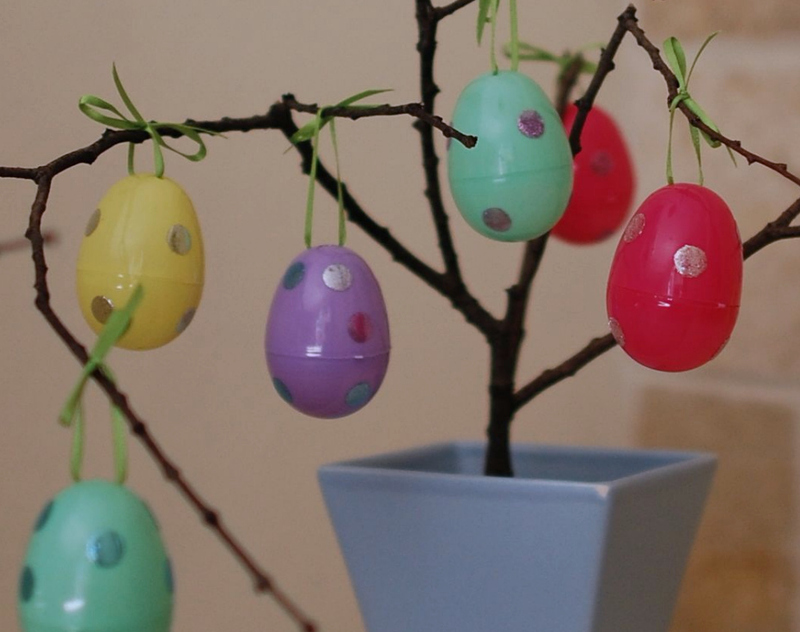 Want some more egg-decorating fun without the threat of an allergic reaction? How about dressing up some egg-shaped food. Here's a meal suggestion for an "egg" tostada bar. No eggy ingredients and it's flexible enough to accommodate for gluten and dairy allergies. Drizzle oil on pan that is lined with aluminum foil. Wipe both sides of each tortilla in oil so that tortillas are completely coated. Bake tortillas for 10-15 minutes or until they are lightly brown and crisp. I usually end up flipping ours over around 10 minutes and baking for an extra couple minutes. While the tortillas are baking, prep your tostada toppings. Have plenty of spoons for your little chefs to spread and pile on the toppings. My kids always eat more food when they've helped make it. Callan got some help but was still a happy eater! In past years, we've never skipped the egg-dyeing, a tradition passed on from my family. Just the kids, the good old fashioned Paas dyeing kit from the market, and lots of anxiety and fear--while outwardly trying to appear calm and delighted. 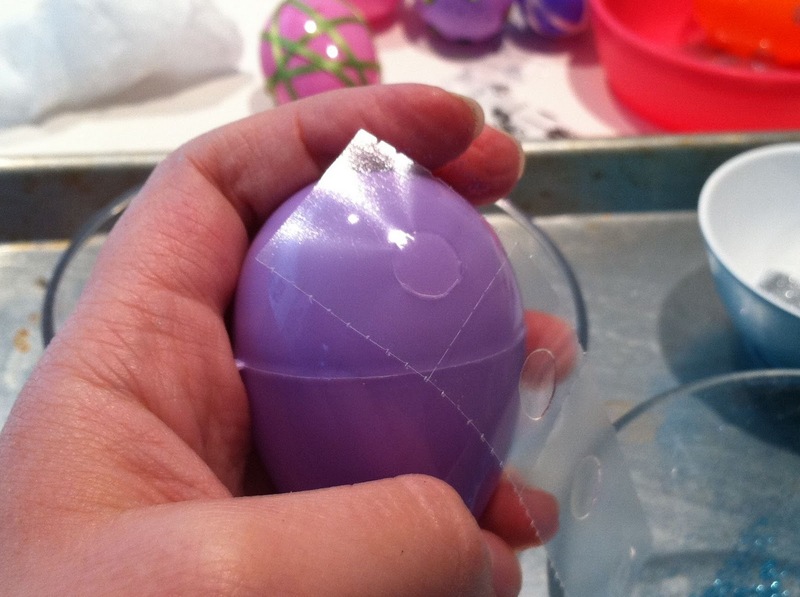 With three egg-allergic children, I finally decided that we would all have more fun trying our hand at decorating the plastic ones than the real deal. Michelle T. provided the inspiration with her glitter eggs, and I went to Walgreens and bought my 150 pack of eggs for $5.00 and let the kids go crazy. The craft store sold these stickers in a roll, to be cut apart, or wrapped around the center intact. The paper mache was too hard for the kids, but may be okay for a very patient 8-year-old or older. Just cut up some scrapbooking, tissue or other fairly thin paper into small squares, and paint a mod podge mixture (add 3:1 m.p:water) on surface of egg and again on top of paper. Let it dry. Who knew how inspirational googly eyes were? If you've got the paper mache stuff out, make a big egg shell bowl using a balloon for shaping. Let it dry (make take a few days) and cut through to make the cracked egg effect. Tristan had fun doing this one. Happy no-dye non-egg Easter egg dyeing, everyone! Sugary, gooey goodness for Easter. Hey, even though I don't give my kids candy, there are plenty of other cavity-inducing treats out there. There are endless variations of these Rice Krispies Easter eggs. I thought the dipper eggs were really cute, although honestly, don't the original treats have enough sugar? Just for fun, and for my chocoholic son, I dipped a few "eggs" in chocolate. I didn't have shortening on hand, so I just melted chocolate chips in the microwave (and heard zero complaints). My kids are pretty adverse to sprinkles, but I think the eggs are pretty darling with them, yes? 1. Melt margarine over low heat in a large pot, and grease the inside of your egg with margarine. 2. Add marshmallows and stir frequently until all is melted. Remove from heat. 3. Add Rice Krispies (and some sprinkles if you like) to pot and stir. 4. Grease hands (more like, slather hands--back and front, and reapply between eggs) with margarine. You'll have to rinse off any castaways during the process too. 5. Scoop up Rice Krispies mixture and use egg to mold (no need to regrease egg). Put on wax paper or Silpat to cool. 6. If you want, melt shortening and chocolate chips on low heat and dip eggs in chocolate and sprinkles. Cool on wax paper and refrigerate. 7. Wrap individually in plastic wrap to store. Variation: Hidden Surprise Easter Egg recipe. They use m & m's in the original recipe (which have dairy) and are a little more labor intensive than the eggs, but I'd LOVE for someone to try them and send me pics! Easter is almost here and for parents of egg-allergic kids it can be a challenge. 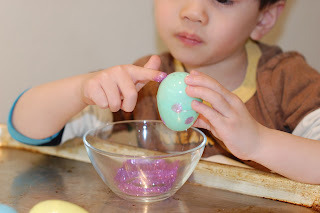 Here's a simple and kid-friendly Easter Egg craft that will keep little fingers quite busy. Apply glue dots, pressing firmly before pulling the plastic backing off. I used 8-12 glue dots per egg. 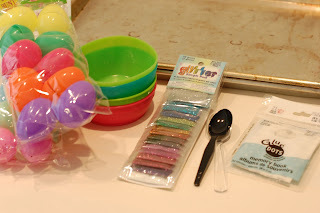 Put some glitter in a bowl and put that bowl on a cookie sheet (to help prevent inevitable spills). Dip your finger into the glitter and apply to the glue dots. 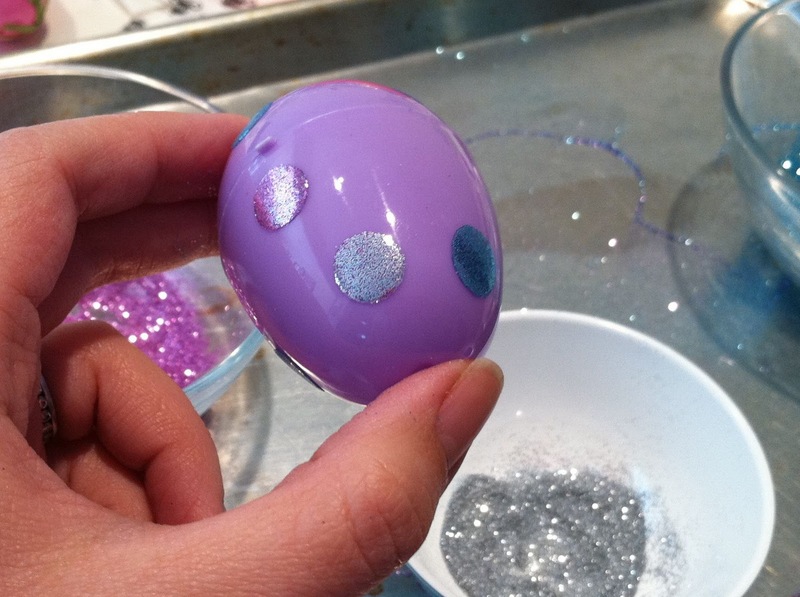 I poured glitter, dipped the egg...but found the finger method to be the most effective and least messy. Once you've got all your glue dots covered, use the dryer sheet to gently wipe the excess glitter off over a cookie sheet or glitter bowl. You can use the same color glitter for the egg, or mix it up. I tried to keep it simple for the kids and only used 3 colors of glitter on an assortment of eggs. I decided to use some simple green ribbon and hang my eggs from some branches we found at the park. It's the Easter Egg Tree. Pretty, right? We made quite a few of these, so I'll use them for the egg hunt as well. I "try" to avoid giving my kids candy, so usually put some stickers, tattoos and erasers in the eggs. Easter Chocolates - no foil wrappers but no major allergens either! I admit it. As much as I get overwhelmed by the commercialization of holidays (really, do we need to see hearts and cupids everywhere the DAY AFTER NEW YEAR'S?? ), I am a sucker for chocolate treats. 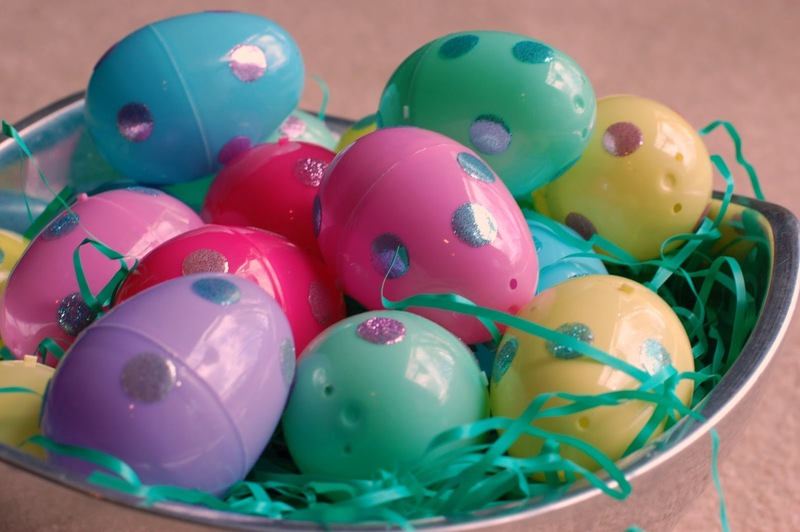 With Easter I have warm, fuzzy memories of baskets filled with fake grass, our decorated hard-boiled eggs, and tiny foil-covered eggs and rabbits. Having two kids who are milk-allergic, one of whom is also peanut-allergic, means no store-bought chocolates. While this can be a big plus (allergies are a valid excuse for always skipping the candy aisle), sometimes my nostalgia for bite-sized chocolates gets the best of me and I long for a way for my kids to enjoy the same childhood treats that I had. With chocolate bunnies and eggs on the brain and Amazon.com always a few taps of the keyboard away, I decided to check out my options. And lo and behold, I found some candy molds, perfect for creating our own allergy-free chocolate candies. Though they do cover up with crazy orange hats, sometimes it's just necessary to slap on the sunscreen! With spring finally here, the sun has begun to shine brightly in my neck of the woods. I find myself breaking out the sunscreen once again. I don't know about you but finding the perfect sunscreen has not been an easy task for our food-allergic family. Eczema and food allergies came hand-in-hand for our eldest child and it is very common for him to develop a bumpy rash from sunscreen or lotion. Although we do have a favorite sunscreen (California Baby), I like to shop around in case there is a newer, better, and (yes) cheaper alternative on the market. I always consult the Environmental Working Group (EWG) first for their top sunscreens based on low toxicity and effective sun protection. It saves me from blindly diving into the seemingly bottomless pool of sunscreens. EWG has taught me that finding a non-toxic sunscreen is as equally important to my kids' health as an allergy-free one. As EWG recommends, I always look for a brand that offers mineral-based UVA/UVB (broad spectrum) protection. Minerals such as zinc oxide and titanium dioxide can be effective sun blockers and, so far as current research finds, do not seem to penetrate the skin and enter the bloodstream. Research, however, has shown that chemicals such as oxybenzone (a common ingredient in sunscreens, moisturizers, and makeup) can cause allergic reactions, hormone disruption, and cell damage. I enjoy feeding my family more than I ever thought I would. There is something about creating a nourishing meal and seeing my family dig in that gives me satisfaction and pride. But as much as I like cooking and baking, there are days when I really need a break! These are the same days when I envy folks who have the choice to simply drive to a restaurant and find something their kids can and will eat without any fear of bringing on an allergic reaction. I recently took the plunge and ordered a 6-quart slow cooker for the family. If you're not familiar with slow cookers or Crock Pots (the most well-known brand), you simply put all your ingredients in the ceramic liner pot, put on the cover, set to low, and your food is done after several hours. (Okay, there might be a couple more steps in the middle depending on the recipe but, still, SO simple!) Stirring is actually discouraged in the first few hours because a lot of the cooking heat is lost each time the cover is removed. I love a cooking tool that is trying to keep me out of the kitchen! The low-heat, no-fuss cooking allows me to safely leave the food to cook while the kids and I run about the house or around town doing our daily activities. Last week gluten-allergy blogs around the country were fired up over the intentional deception of a Colorado chef. Damian Cardone is was a Colorado chef who boasted on Facebook about serving customers high-gluten pasta in place of what was supposed to be gluten-free pasta. He tried to justify his actions by proclaiming his belief that gluten allergies are mostly imagined issues and that, just as he predicted, no one got sick from his trick. (I'm guessing he doesn't know that gluten-allergy symptoms might not present themselves until a couple hours after consumption and that wheat ingestion by those with Celiac Disease or a severe gluten allergy could lead to anaphylaxis.) Mr. Cardone's cavalier admission has led to his firing, his going underground (to avoid lawsuits and death threats, no doubt) and uniform outrage across message boards from food-allergic and non-allergic people alike. After reading this story I couldn't help but think about the controversy in Edgewater, Florida. If you haven't heard about it, parents at an elementary school protested against the school's strict protocol for protecting a student with a life-threatening peanut allergy. Included in the daily protocol were that all students had to wash their hands and rinse their mouths at the start of school and after lunch, parents could not volunteer in the classroom for fear of contamination, teachers were required to frequently wipe down work surfaces, and no outside food (whether they be for kids' lunches or class parties) could be brought into the student's class or nearby classes. Unhappy parents felt their kids' rights were being sacrificed for the welfare of one child and went so far as to suggest that the child be homeschooled if the normal school environment was that potentially harmful to her health. Allergy-free Snack Lists - What's in your backseat? If my kids could have it their way, they would graze on finger foods all day and never sit down for any of their meals. Snacks have always been thought of as special treats, maybe because it's food the kids like combined with the absence of the usual "wash your hands at the sink" and "stay-in-your-seat" rules. With Spring Break, long weekends, and (gasped!) summer vacation not too far in the future, we thought it would be nice to find out what favorite allergy-friendly snacks are in your tote bags and purses. Following are favorite snack lists made by your GAW friends and other readers, many of whom have kids with multiple food allergies. Different food-allergic kids can have different levels of severity -- for example, some gluten-allergic kids can eat oats without problem while others have such severe reactions that certified gluten-free is necessary; some soy-allergic kids can tolerate soy lecithin and some can't. As with all products and recipes we post here, please always double-check ingredient labels yourself before giving any new snacks to your little eaters. And always have your allergy meds ready in case of a reaction.